Sharp's latest attempt to get consumers to open their wallets and jump on the high-definition bandwagon has resulted in an Aquos-branded PC designed to integrate seamlessly with the rest of the company's products. 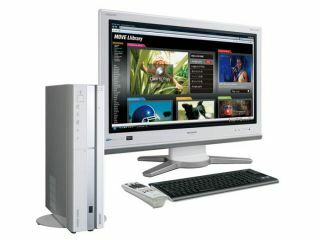 The Internet Aquos computer is available in a range of five colours and configurations, but without a monitor. Instead, there's an HDMI connection and the suggestion that shoppers splash out on an Aquos HD TV set as well. Sharp labels the concept of networking the PC, TV and also a Blu-ray player as 'Aquos FamiLink', a pun that works a lot better in the original Japanese. As you might expect, the PC comes with a remote-control handset that works with any Sharp equipment and includes a touch-sensitive pad for controlling the mouse pointer. On top of that, the range of PCs have terrestrial digital TV tuners, a choice of CPUs and dedicated PVR hard drives up to 500GB, and Windows Vista Home Premium. When they go on sale in Japan between the end of November and mid-December, prices will range from ¥110,000 (£460) to ¥230,000 (£963).